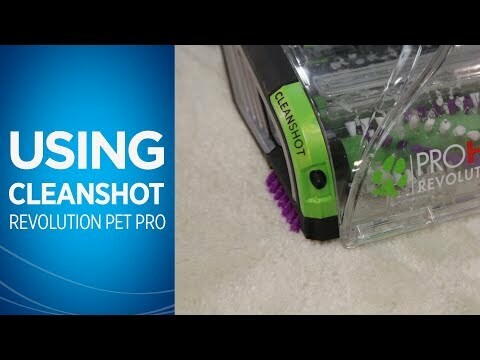 The ProHeat 2X Revolution Pet is our best deep cleaning system for pet messes! Just like you, we love our pets, but, eventually, every pet makes a mess. 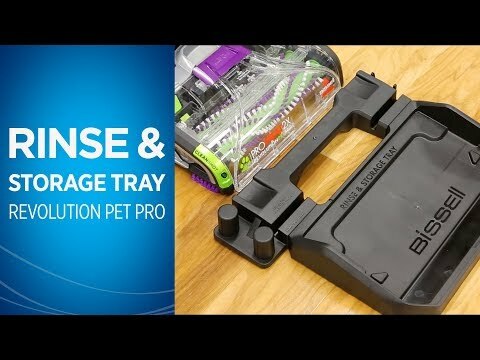 Whether it’s tracked-in mud, food spills, or even accidents, the BISSELL® ProHeat 2X® Revolution™ Pet handles tough pet messes thanks to the exclusive Pet clean-up system. 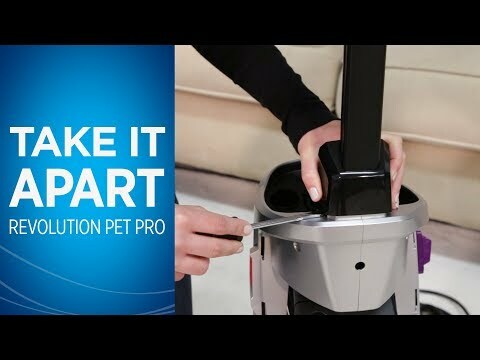 The system includes CleanShot® pre-treater to remove spots and stains; the 2-in-1 Pet Upholstery Tool to remove pet hair, stains, and odors from upholstery; and an EZ Clean Brush Roll Cover to make maintenance of the machine easy. Plus Deep Clean Mode offers powerful cleaning to outclean leading rentals,* and carpets dry in about an hour with Express Clean Mode. ** All of this cleaning power comes in a lightweight and maneuverable machine with a low-profile foot that gets under furniture. 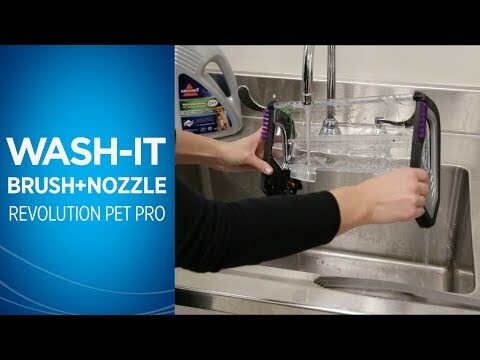 With the BISSELL® ProHeat 2X® Revolution Pet, you have everything you need to take on tough pet messes. CleanShot® Pretreater – Integrated pretreater for attacking spots and stains. 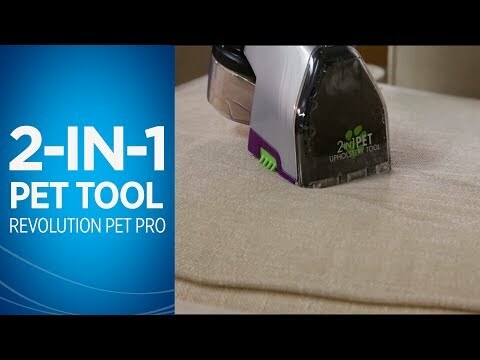 2-in-1 Pet Upholstery Tool – Removes pet hair, stains and odors. Adjustable Cleaning Mode – Dries in about an hour with Express Clean Mode** so you can get back to your floors. •Dual Dirtlifter® Power Brushes combined with Heatwave Technology® work to remove dirt and stains from your carpet. 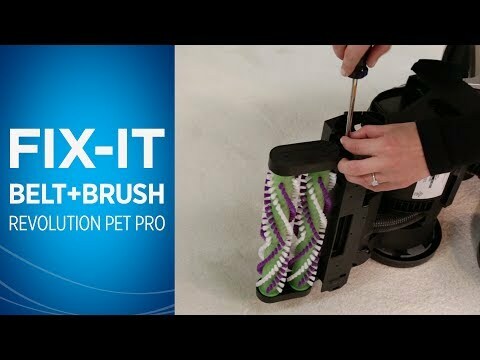 Includes 2-in-1 Pet Upholstery Tool, 3-in-1 Stair Tool, 3″ Tough Stain Tool. All I can say is This machine is amazing!!! 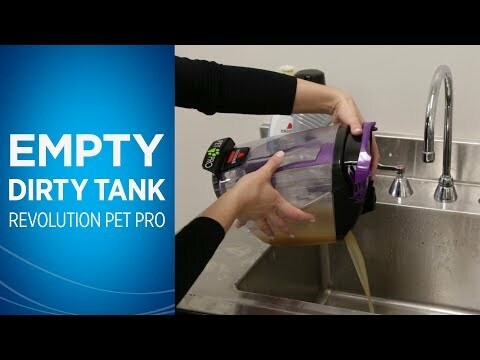 I am using this machine to replace a Bissell DeepClean Lift-Off® Pet Carpet Cleaner which I was pleased with, but am replacing due to age, wear/tear and convenience. 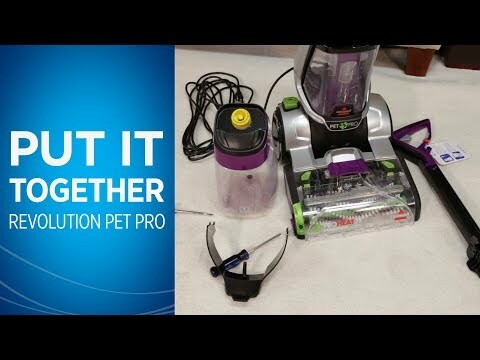 Since receiving the ProHeat 2X® Revolution® Pet Pro Carpet Cleaner I have used this cleaner for my typically cleaning include pet urine (low pile carpet), high pile shag like carpeting and low pile berber carpet. The performance of this machine is much greater than that of my older Bissell. I can not attribute the improved performance to the shampoos as I am using the same formulas including the Oxyboost. 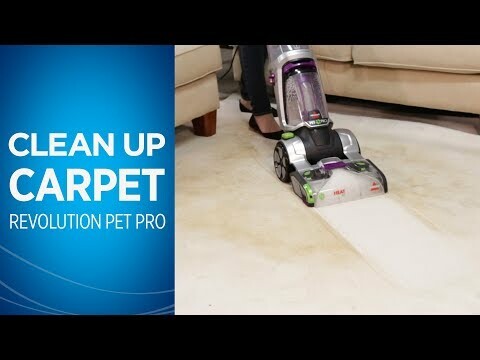 Older pet stains were lifted, carpets looked cleaner and typical odors associated with leftover pet stains were absent. I typically have to clean that area at least once a week. The most drastic improvement was that on the berber carpet. My old cleaner while would improve the look of the carpet stains would still be present. 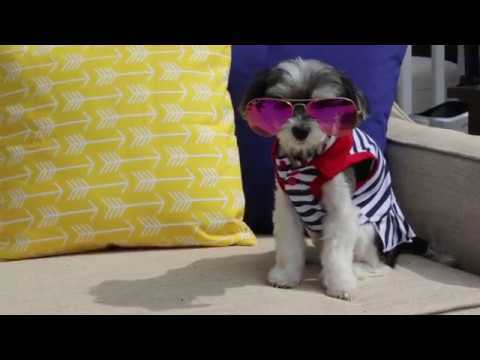 The new ProHeat 2X® Revolution® Pet Pro Carpet Cleaner removed all stains from the berber carpet. These stains resulted from approx 2 years of foot traffic, use of walker and wheelchair. The weight difference and maneuverability of this machine compared to the old one is greatly improved. It feels almost as if using a standard vacuum cleaner with some of the bulk and weight gone. I have test fitted the hose, ease of connecting/disconnecting and overall length. I am please with all these functions and reach, but not have yet tested the cleaning capabilities with the various attachments included. Purchased this as a gift for my spouse to replace an older model Bissell. He loves it. 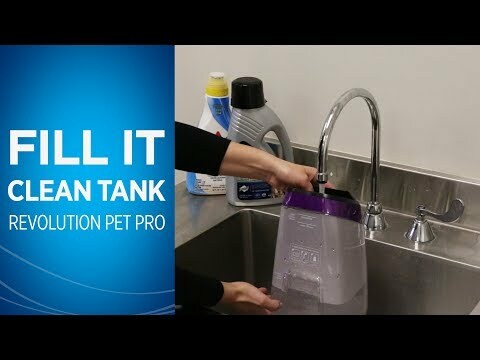 It cleans so easy and is so powerful for it's size and weight. Perfect for cleanup after our 4 cats and 2 dogs, and 2 kids. It worked great cleaning my carpet. Was impressed. The first time I used the cleaner it did a great job. But then it started leaving a dirty line on the carpet where I stopped. It has a cleaning tray which I used after each use but still the dirty line. Now I clean the carpet with cleaning solution then I go back over it with clear water and that seems to help. Which means I'm cleaning the carpet twice. If not for the dirty line, it would be a great carpet cleaner. Hi DK - there could be a clog in the front nozzle causing dirty water to drip down. Give us a call and we'd be more than happy to check your machine and make sure it's working correctly. 1-800-237-7691.